Do you remember the expansion in scope you felt when Darrow first heard the term “low red?” When he was in that cabin with Dancer and learned that big, brutal, bitter, paradigm-shifting lie? 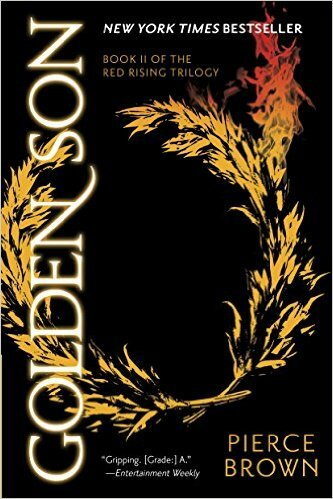 Pierce Brown manages to expand the scope again in Golden Son in a way that breaks free of the previously-mentioned allusions. This book, in many ways, creates a unique identity that perhaps the first book was slightly lacking. It may not seem that way in Golden Son’s first couple of chapters–as there is another learning institution–but don’t worry. In typical Brown fashion, he moves on quickly, like a wriggling slithering snake. Twists. Action. Pace. Introspection. Intense moral ambiguity. Deception. Betrayal. Large-scale combat. Intrigue. All hallmarks of Golden Son, but maybe most importantly of all, Brown handles one of my primary concerns with scary-good skill: with such an advanced society, and with Darrow rising so high in his capabilities, how do you avoid the issue of him becoming completely overpowered? Or his opponents being overpowered? How do you manage all of this advanced tech in such a way where the struggles and plights are interesting? My god … he does it with such brilliance–you may not even notice he’s managing these things, that’s how good it is. The relationships Darrow has developed become paramount as his lie becomes harder and more meaningful to keep going. His decisions, gut wrenching. The consequences … often worse. In many ways, the relationship dynamics are what makes this such a step forward, in my opinion. And of course, the plot is perfect “act two” stuff. Where the first entry had the previously-mentioned and obvious allusions, this entry feels like a nod to Empire Strikes Back. Not because the plots are similar, or that the themes are borrowed–because I don’t think they are–but because of that feel you get towards the end. That feel. I think this is a huge compliment, as it’s my opinion that Empire Strikes Back might be the best piece of act-2 science fiction ever created, so capturing that essence is a huge win. I’ve already started Morning Star: Book III of the Red Rising Trilogy, and I can’t wait to keep reading!